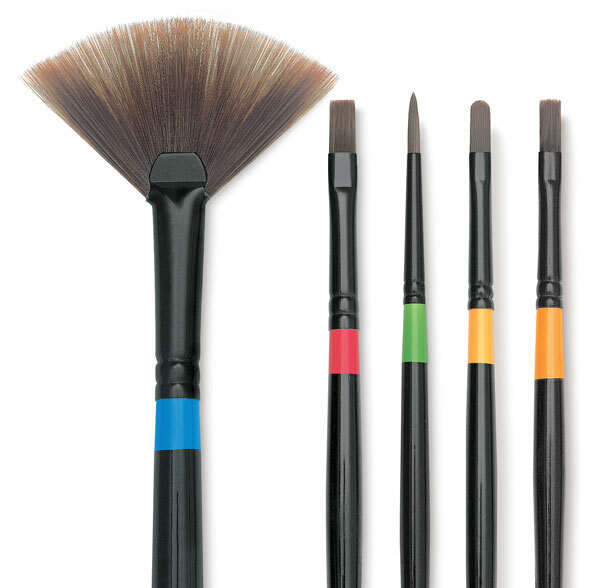 Utrecht Manglon Synthetic Brushes (Series 239) are constructed with unique multi-colored, multi-diameter synthetic Taklon. Each filament is tapered to a fine point, dyed, and then set into black-plated seamless brass ferrules. The ferrules are securely fastened with deep double crimping on long black lacquered handles. Known for their excellent paint capacity, these brushes have the silky feel of fine sable, an extraordinary snap-back, and great shape retention. They work well for sharp, clean brushwork and edging with medium-bodied to heavy-bodied paints. Available in a variety of sizes and shapes, Utrecht Manglon Synthetic Brushes are great for use with oils and acrylic paints. Set of 4 — This set includes a #4 Round, #8 Bright, #12 Filbert, and #18 Filbert.